Contemporary styling of the Palmetto Collection seat benches offer a sleek inviting look for just about any type of setting. Its modern style is accentuated by the contoured design and 5/8" horizontal steel rod construction. Available in powder-coat finishing that will not chip or fade and also inhibits abrasion, rust and corrosion even through continued seasonal weather conditions. Achieve a cohesive look and maximize seating in spaces having multi-varied constraints with the inline 2, 3 and 4 seat configurations. 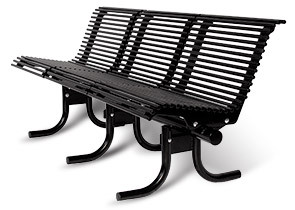 The all steel Palmetto bench is great for transit	stations, urban park settings, gardens, along sidewalks or building exteriors and is available in portable, surface and in-ground mount styles.